On Wednesday evening, Alicia, Allison and I scrambled back to the house after our first house intramural soccer game (though we fought valiantly, zero goals were scored) in order to prepare dinner. We had the honor of hosting Jeff Walker of the Earth Science department for our inaugural Dinner with a Professor. Using vegetables from our PFP share, our various field work farms and Adams, we cooked a delicious “Golden Curry” from the Moosewood “Cooks for a Crowd” cookbook. After overcoming a few challenges like finding a large enough pot for 24 servings of curry (hey there leftovers), we settled down around the dinner table—the nine of us, Candice, her husband, Patrick, and, of course, our special guest, Jeff. 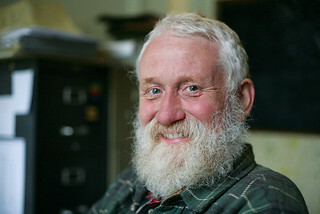 Jeff Walker, originally from Seattle, Washington, has been a professor at Vassar since 1988. If you don’t already know who he is, I’m sure you’d recognize his fantastic white beard and friendly smile. He teaches a number of courses in Earth Science including “Field Geology of the Hudson Valley” which takes students out to Mohonk Preserve to engage in the practical side of academics. From our dinner conversation with Jeff, it became clear that he is not the kind of person who just talks the talk of environmentalism; he also walks the walk. He is a farmer as well as a professor. Since 1997, he has lived with his wife, Kathy, his seven children and a dozen laying hens, 20 meat chickens, a dozen turkeys and a couple of sheep and two milking goats (though at one point early on there were around 26 goats!). Jeff explained that he doesn’t like the label “sustainable” because there is always more that can be done to be more efficient. Instead he prefers to say that he’s “working toward sustainability.” But by most people’s standards, his farm is incredibly sustainable. They managed to reduce their energy consumption enough to live off 1-2 kW-hr/day for 9 years! To do this they used no appliances or hot water. The only grid energy they used was for lightbulbs and an electric pump. The Walker family heated their house and cooked their food on a woodstove fueled by wood they chopped themselves. Apparently once people find out that you’re heating your house solely on a woodstove, large quantities of wood just appear in your driveway. Jeff told us that he finally gave in and got a refrigerator because they were tired of losing so much of their goat milk to spoilage. And, the amount of “sit-cheese” they were making was overwhelming them. We also spent a good deal of time talking to Jeff about the upcoming deer-hunting season. He’s been hunting for years on his property. He told us about the various challenges and rewards of butchering a deer. Though he’s never been officially taught the exact cuts, he can manage to butcher a deer pretty well and if you can get 40 pounds or so of meat together, you can bring it to Joe Malafy who will make it into a fantastic kielbasa sausage. Dinner was a lively conversation, though we do feel a little guilty for pestering Jeff with so many questions he hardly had the chance to take a bite of curry. As our first weekly dinner guest, Jeff has set a high bar. Basically we all just want to pack up and move to his farm. Getting to know Jeff showed us that if you really want to do something, you can. It’ll probably take a lot of work and some sacrifices, but it can be done. The question now is: how can we convince other people to do the same? How do we get our generation out of its comfort zone?